Researchers hoping to use carbon nanotubes for quantum computing -- in which the spin of a single electron would represent a bit of data -- may have to change their approaches, according to new Cornell research. Cornell physicists have found that the spin of an electron in a carbon nanotube is coupled -- that is, interacts with -- the electron's orbit. The finding means researchers will have to change the way they read out or change spin, but offers a new way to manipulate the spin, by manipulating the orbit. At left, the expected result when a magnetic field is applied to a single electron orbiting a carbon nanotube. At right, the result of Cornell experiments shows a difference at zero field, indicating the states are not symmetrical as previously believed. The research is reported in the March 27 issue of the journal Nature by Cornell professors of physics Paul McEuen and Daniel Ralph and former Cornell researchers Shahal Ilani, now at the Weizmann Institute of Science in Israel, and Ferdinand Kuemmeth, now at Harvard University. Carbon nanotubes are tiny cylinders whose walls are made of carbon atoms arranged in connected hexagons, sort of like a rolled up tube of chicken wire. 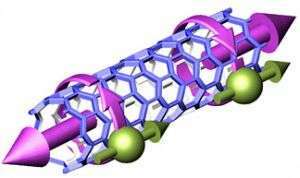 Rather than orbiting individual atoms, free electrons in a nanotube orbit around the circumference of the tube. Meanwhile, the electron going around that circle can have its spin oriented in two possible directions. Until now, physicists believed that the four possible states of an electron -- with spin up or down and orbit clockwise or counterclockwise -- must be perfectly equivalent. To test this, the researchers used the Cornell NanoScale Science and Technology Facility (CNF) to create a tiny device in which a carbon nanotube about 5 nanometers (nm -- a nanometer is a billionth of a meter, about the length of three atoms in a row) in diameter and 500 nm long was mounted between two electrodes above a silicon structure that allows the application of varying electrical charges to the tube. The design of the device made it possible to create quantum dots containing a small number of electrons, all the way down to a single electron. By applying a magnetic field along the axis of the tube and measuring the current flow through the tube, the researchers could determine the energy levels of electrons in the four possible combinations of spin and orbit and found that changing the direction of orbit changes the energy. The orbit of the electron affects its spin and vice versa. "This doesn't overrule using nanotubes in quantum computing, but it defines new rules for designing them in nanotubes," Ilani said. "It is also interesting from the fundamental physics point of view, because it is the unique cylindrical topology of nanotubes that allows the electrons to have well-defined orbits and therefore to have this coupling." The same experiment was performed with "holes" -- places where an electron is missing, creating the equivalent of a positive charge moving around the tube. Again, it had been believed that the energy of a hole would be the same as that of an electron with the same spin, but the experiment showed otherwise. 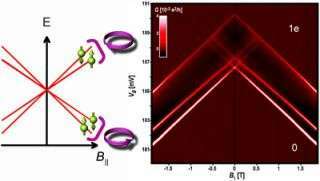 quantum states are not coupled. Spin and energy level are not coupled. They can interact by exchange of photons.